Mitsubishi will field two MiEV Evolution III all-electric race cars in the 2014 edition of the famous annual Pikes Peak International Hill Climb later this month, hoping that it will be third time lucky. MMC has competed twice before in the Electric Division in 2012 and 2013, and will hope to leave Colorado as the winner in the new Electric Modified Division. The MiEV Evolution III is an improved and evolved version of last year’s race car. Main components including the high-capacity battery, electric motor and electric powered 4WD consisting of four electric motors have been retained, but the chassis has been lightened. Total output of the four motors has been boosted from 400 kW to 450 kW, and to ensure all the extra power is put down on the road, the tyres have been uprated in size. Accordingly, downforce has been increased with a new carbon cowl design and with wind-tunnel optimisation of the spoiler. Evolutionary development of the S-AWC integrated vehicle dynamics control system has improved traction control performance and reduced wheel slip by controlling vehicle attitude more precisely when near the limit of adhesion. This will give the drivers added confidence. Speaking of them, the drivers have been retained. One unit will be driven by two-time Dakar Rally champ Hiroshi Masuoka (second place last year) while the other will be piloted by Greg Tracy, six-time Pikes Peak motorcycle champion. The latter came in third last year in his first attempt up the 156-corner, 20 km course on four wheels. “I am confident that MiEV Evolution III will demonstrate the full extent of its potential over a course such as Pikes Peak with its 156 corners. Together with Greg Tracy, my team mate from last year, we will be going flat out for victory in the Electric Modified Division. We look forward to your support,” said team captain Masuoka. 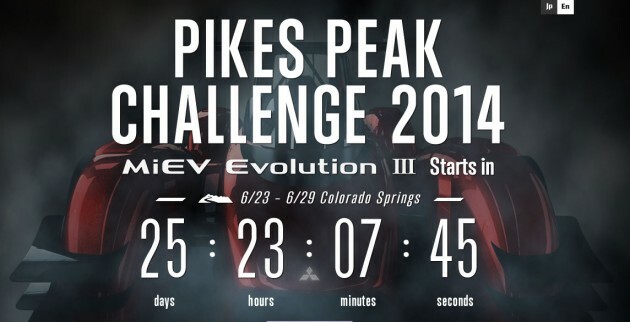 See Pikes Peak videos by MMC, 2013 winner Peugeot, Land Rover and Audi/Ducati for an idea of what it’s like up there. Also, read our live report from the 2012 PPIHC for a first-hand account and pics. 400 kW ~ 450 kW(536 ~ 603hp), not sure others car performance, but this looks so powerful. Pretty cool. Hope they make it this time.